Intraday Time Frame: 15 min , 30, mim, 60 min. 2 sets of exponential moving averages, divided by three3(EMA) moving averages, the first 3 periods (orange red line), the second of 21 periods (magenta line) and the third of 55 periods (yellow line). 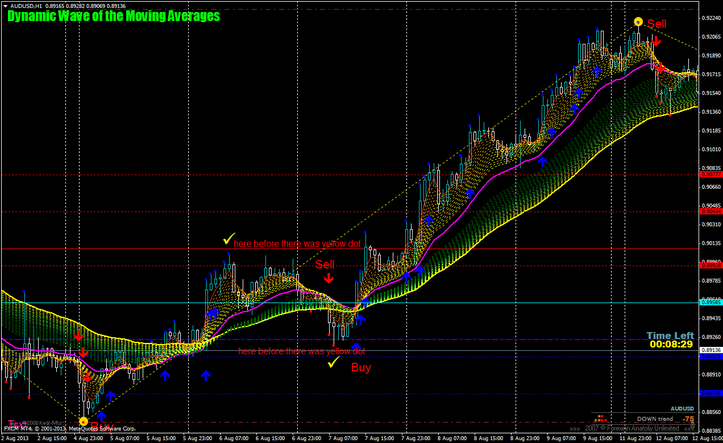 Dyamic Wave of Moving average arrow. when appears a buy arrow of the Dyamic Wave of Moving Averages arrow indicator. when appears a sell arrow of the Dynaamic Wave of Moving Averages arrow indicator. 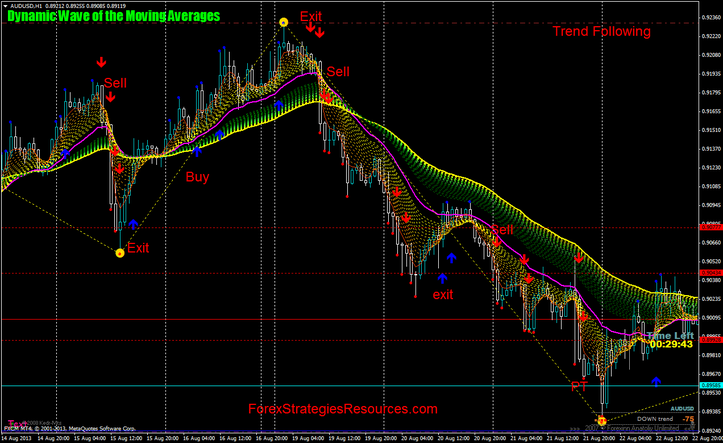 In the pictures belowDynamic Wave of the Moving Averages in action. Wait the yellow dots and buy or sell at first arrow, if the movement of the price is in trending exit with the previous rules, if the movement of the price is counter trend exit with a fast profit target thet depends by time frame and currency pairs. These Templates are also good for trading with Binary Options. After doing a lot of practice on a demo account, you can use the methods together and change the template in a better way. This template is like a framework for developper. I think trend following 30 min, 60 min. Best TimeFrame for this system ? Dynamic Wave of the Moving Averages: Indicators and Templates.